Official lays out a possible plan for fresh polls now postponed until 2016. Fresh polls to restore democracy in Thailand following a military coup in May will be delayed until February 2016 at the earliest, the country’s deputy prime minister said on Tuesday. “I told the U.S. charge d’affaires today elections will take place at the earliest in February 2016,” Wissanu Krea-ngam, one of the government’s top legal experts, said following talks with U.S. Charge d’Affaires W. Patrick Murphy. Wissamu also laid out a rough timeline for how things might proceed in the run-up to the election. He said the charter draft would be ready by early September 2015, and that the king would probably endorse it within a few weeks. The lawmakers would then take three months to write the necessary constitutional laws up till December 2015, following which the country’s election commission would need 60 to 90 days to carry out the relevant procedures. But Wissanu also warned that a possible referendum on a new constitution could push back the election date even further till May 2016. “But if we have to have a referendum, polls could be delayed by a further three months,” he said. Wissanu’s comments are the latest in a string of statements by officials confirming suspicions that Thailand’s general election will be postponed further, contrary to a previous pledge by Prime Minister Prayut Chan-o-Cha to hold polls around October 2015 after seizing power in a coup six months ago. Earlier this month, Thai finance minister Sommai Phasee told the BBC that polls could not be called until about mid-2016, an estimation that defense minister and deputy prime minister Prawit Wongsuwon later said he also agreed with. Prayut himself has been increasingly coy and vague about when an election will be held. 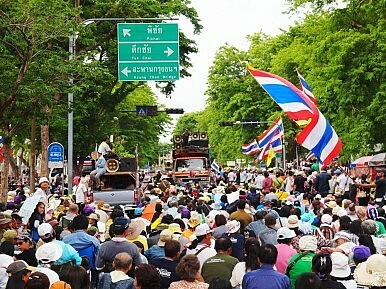 Pornchai Trakulwaranont, the prominent vice rector for administration at Thammasat University, had earlier predicted a date even farther out into mid-2016. Pornchai told Xinhua that a referendum on a new constitution, which would take shape around mid-2015, would have to be held to secure “legitimacy from the people” first before proceeding. That process could take at least three months, and it would have to be followed by an additional three to four months addressing issues coming out of the referendum and potentially modifying the draft charter. Under that timeline, Pornchai said, Thailand would only have a new constitution by the end of 2015. It would then take around four months to prepare for a general election, taking the date to mid-2016. The coup leader regularly offers his thoughts to a television audience. Irregularities Cloud Thailand’s 2019 Election ResultsThailand 2019 Elections: Conflicting Claims as Final Result Wait ContinuesWill the Upcoming Thai Elections Be Free and Fair?Prayut in Full Campaign Mode for Thailand’s 2019 ElectionsWhat Does Thailand’s Royal Shockwave Mean for its Future Politics?